Do you have concerns about the future of our economy and governance? Linear consumption-waste as the basis for growth? How do you stand on your rights? How do you protect your earnings and assets? How do you create something worthwhile in the current environment? Given the mess we've created to date, how do we best move forward? What are the specific tools to accomplish the goals at hand? 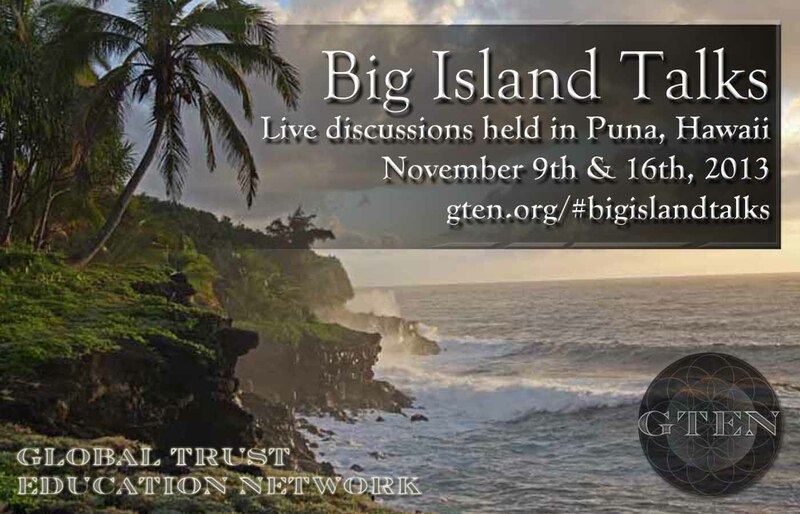 These two live GTEN talks combine structured presentation with fluid and informal discussion, tailored to the interests of the forum and their specific questions. June 19, 2013 : New Member Special Offer announced! The New Member Special Offer gives you the opportunity to experience our upcoming live webinar Trust Web Structures for free if you register for Private Trust Education. 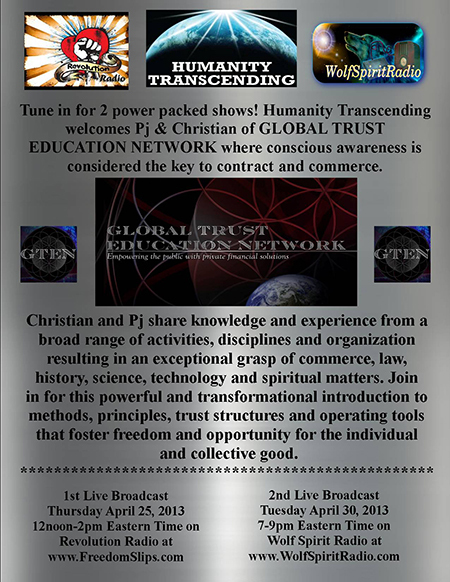 We believe strongly that the Private Trust Education Series is the best place to start if you're new to GTEN.org. With Private Trust Education you will gain a comprehensive understanding of how to set up and operate a private express trust, with the trust indenture and all the needed documents provided. Then with Trust Web Structures you'll gain the understanding of how to operate from that private position out into the public. May 22, 2013 : Email Communications Fixed! Thanks for bearing with us while we worked with our domain host to eliminate the frustrating communication issues we were experiencing. All communications have been restored. All emails we received have been answered. If you have contacted us and did not receive a response, please resend your email. We will answer promptly. Our new live webinar series, Exempt Organizations - Public and Private Wealth Structures Defined, will begin May 15, 2013 at 5pm PT, 8pm ET. Previously scheduled for May 8, the start date has been moved back one week to allow us time to recover from a technical glitch with our email communications. If you have contacted us by email and did not hear back, please email us again. We missed many emails due to technical failure. We are working on the problem and look forward to a valuable evening with you May 15. For full details, please click here. 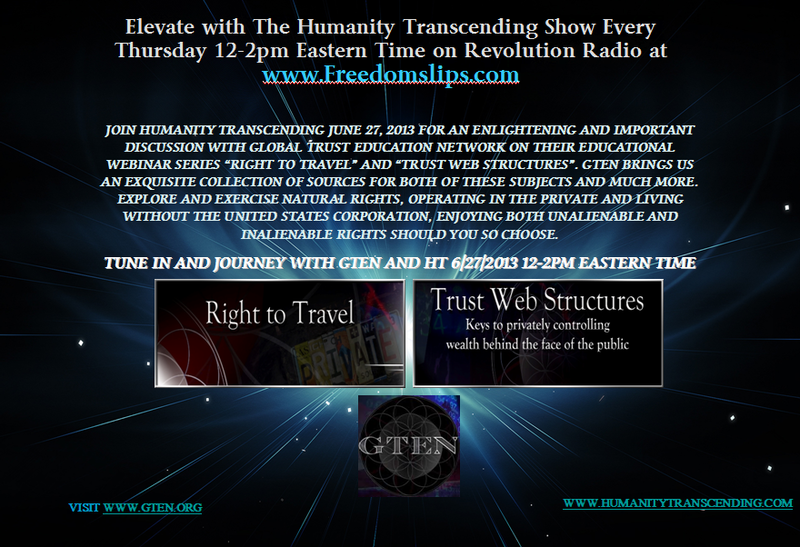 April 21, 2013 : GTEN Trustees to appear on Revolution Radio! March 29, 2013: New 2013 seminar slate released!